Feeding corals is definitely something a lot of reefkeepers struggle with. 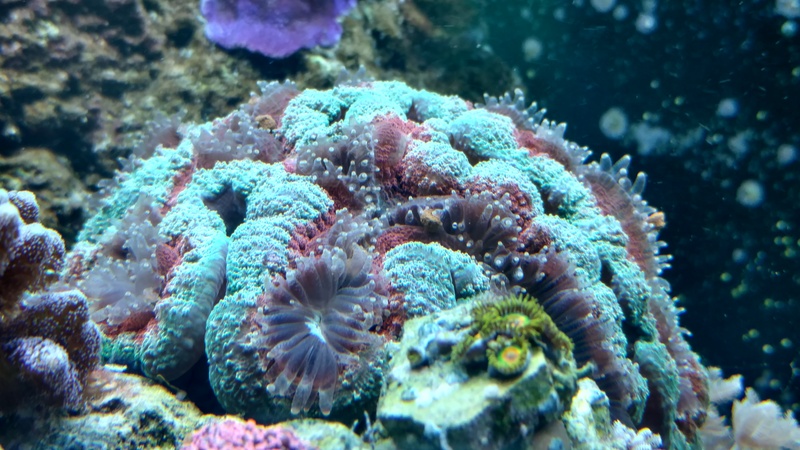 Many overfeed, feed inappropriate foods (foods that are too large or too small for the corals they have), broadcast feed the whole tank when they only have a few corals that should be spot fed, etc. When you ask people about what should be fed you will get about as many different answers as the number of people you ask. One person will tell you not to feed anything. Another will say fish poop. Another will say to feed a massive variety of frozen foods. Another says to only feed powdered foods. The reality is that every tank is different. A tank should not be treated as though it is a cage with some fish anc corals in it, the tank as a whole is a system. Some tanks can handle a lot of feeding. Some have so many fish that what is fed to the fish will also make it to the corals. One thing to keep in mind is that the more livestock is in a tank the more feeding the tank can handle, but be careful not to overfeed. 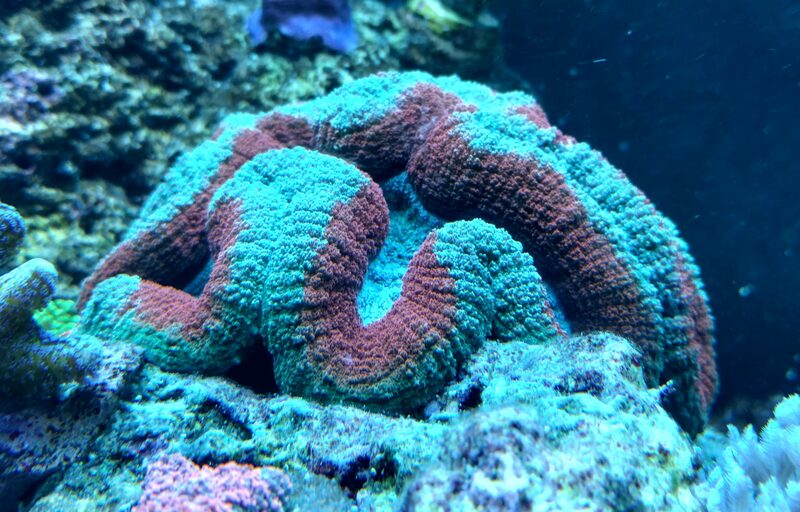 This means that in the beginning while there are still only a few corals and a few fish the feedings need to be very limited to avoid excessive nutrient input. People have a tendency to try to feed very well, this is considered a good thing in many situations (even an act of affection and love for many if not most people) but in an aquarium this can lead to turning your tank in to an algae farm. I will highlight some of my absolute favorites, foods I consider to be indispensible. These have proven to be great options over the years time and time again. It is hard to feed corals without feeding fish, after all the reef tank is not a glass box with fish and corals in it but it is a whole system. Because of this almost all of the foods listed below are for corals and fish. Cyclopeeze: Cyclopeeze is a frozen food and is one of the best all around foods in a saltwater aquarium. Many small fish love it and it is one of the best things to get them eating quickly. These fish include gobies, firefish, small blennies, small clownfish, anthias, chromis, royal grammas, and more. It is also very useful for many corals. Gorgonians (sea fans) will love it, I could actually watch mine grab the cyclopeeze and could even see it inside the polyps. It comes in a bar but they finally started making it in cubes, although for some reason they are only selling the cubes as a combination pack with P.E. Mysis. The cubes are also pretty big, not useful for many tanks. I prefer the bar. People usually either shave a little slice off the end with a small knife or dip the bar into water until the desired amount thaws and comes off (takes a few seconds). I recommend shaving off what you need to avoid accidentally overfeeding. You can thaw it out in a small cup of tank water and then spot feed with a pipette or just broadcast feed if enough things in the tank will eat it. I had a clown goby that would actually come right up to the pipette and take it directly from the pipette. P.E. Mysis: P.E. Mysis (made by Piscine Energetics hence the P.E.) is another very versatile food that can be fed to fish or corals. It is very good for getting larger fish to eat including large clownfish, tangs, cardinals, large blennies, and many predatory fish. P.E. Mysis is essential if you buy a copperband butterfly (they will also take to clams on the half shell very well). Many LPS corals will accept P.E. Mysis and even some larger mushrooms will be happy to eat them. Don’t be mistaken, P.E. Mysis is not the same as any other mysis and is definitely worth the extra cost. New Life Spectrum: New Life Spectrum (NLS) is another very versatile food for all types of fish and corals. Because it comes in so many sizes it can feed almost anything. All varieties of NLS contain garlic but the Thera+A formula has enough garlic to kill parasites, something that can be very useful when adding wild caught fish to an aquarium (effectively all saltwater fish are wild caught). It also comes in many sizes. It is the only thing I recommend feeding saltwater fish if they will accept it. The garlic in NLS helps encourage most fish to take it with enthusiasm, although some are hesitant because it does taste different than most foods. Although it would be ideal if every fish would take NLS since it is healthier than even the most varied diet of frozen foods, the reality is that there are few tanks where every single fish will accept NLS. I recommend feeding NLS first and then feeding frozen food. This encourages all of the fish to eat NLS since they will be hungry. This also gets the ones that will accept it full on NLS before the frozen food is offered. Then the frozen food can be offered to ensure all of the fish get their share of food. For more information on NLS Please read the article New Life Spectrum Fish Food. Below are before and after pictures of a Symphyllia in my 75-gallon display. It would not open for any food. I tried P.E. Mysis, LRS Reef Frenzy, frozen shrimp from the grocery store, and many others. It never opened for anything. I placed a few pieces of New Life Spectrum on it and it blew up, I couldn’t believe it. Golden Pearls: Golden Pearls are an amazing food with many uses. It is a very small pellet/powdered food that comes in many sizes from 5 to 800 microns. One of the most amazing things about Golden Pearls is that they can be used to completely replace all other fry foods. Many fresh and saltwater fish are being raised on nothing but Golden Pearls. This means breeders no longer have to culture brine shrimp and other fry foods. I can personally vouch for this, I was able to raise a brood of fancy goldfish that was accidentally spawned in the main tank. I had three different sizes of Golden Pearls on hand and stepped them up as they grew until they were large enough to feed on the New Life Spectrum Grow formula. I also had great results feeding it to my reef. When I fed Golden Pearls to the reef tank every single coral opened up to feed with a stronger response than any other food including Rod’s Food. One of the unique things about Golden Pearls is that is doesn’t float or sink right away but actually has a neutral buoyancy so it drifts through the tank for much longer than other foods so that it is actually fed on for longer. I have purchased Golden Pearls from YourFishStuff.com and been very happy with their pricing, shipping, etc. and would be happy to buy from them again. If you are interested in this food they are the source I recommend. Oyster Eggs: Oyster Eggs can be really good for SPS corals. Their small size makes them unsuitable for LPS and even most fish. If you have a tank with a lot of SPS definitely try oyster eggs and see if they make a difference in your tank. Brine Shrimp: I have heard many people say that brine shrimp is nothing more than shells and I am not sure where this information came from, and of course no one can point to anything beyond ‘I heard it from…’. In my opinion all frozen foods are incomplete and unbalanced nutrition. They offere protein, fat, a few other nutrients, but are not complete enough or well balanced enough to rely on as the staple of any diet, even with a lot of variety. Since they spirulina brine shrimp have spirulina in them as well I would recommend these over regular brine shrimp. Veggie Based Frozen Foods: There are a variety of veggie and algae based frozen foods out there that can be great for things like tangs if you cannot get them on New Life Spectrum. Phytoplankton: Phytoplankton is overfed in most cases. Very few corals even eat it and almost none of those need it to survive. In most cases feeding phytoplankton of any kind is doing nothing more than polluting the tank.